"Maybe he's right - what if we shouldn't be here…" A24 has debuted the first trailer for Joe Talbot's The Last Black Man in San Francisco, one of the best films out of the Sundance Film Festival this year, and already one of my favorite films of the year (not much will be able to top it). Winner of Best Director and a Special Jury Award at Sundance, The Last Black Man in San Francisco is a sweeping story about friendship and holding on to your roots in a rapidly changing world. Talbot crafted a gorgeous tribute to hometowns and how they're made—and kept alive—by the people who love them. Jimmie Fails stars as himself, a SF native who travels every day to a house in the city to take care of it. The cast includes Jonathan Majors, Danny Glover, Tichina Arnold, Rob Morgan, Mike Epps, Finn Wittrock, and Thora Birch. This is a beautiful trailer for a beautiful film, and I can't wait for it to arrive in theaters. I wrote a glowing review out of Sundance, and the film already has a guaranteed spot on my Top 10 of the year. A must watch trailer. From my Sundance review: "It's an authentic and moving study on finding your place in this modern world. It pulled me in with its gorgeous visuals and heartfelt vibes - one of the best films of the fest." Love this film. A young man (Jimmie Fails) from San Francisco searches for home in the changing city that seems to have left him behind. The Last Black Man in San Francisco is directed by American filmmaker Joe Talbot, making his feature directorial debut after one short film previously. The screenplay is written by Joe Talbot and Rob Richert, from a story by Jimmie Fails and Joe Talbot. This premiered at the Sundance Film Festival earlier this year (read our review), and won the Best Director prize and a Special Jury Award for Creative Collaboration at the festival. 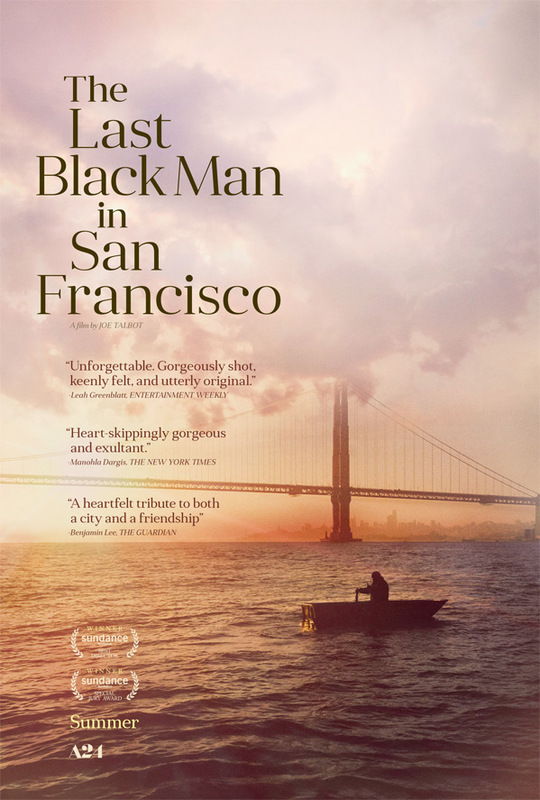 A24 will release Talbot's The Last Black Man in San Francisco in select US theaters starting on June 7th, 2019 in the summer. Follow @A24 for additional updates. First impression?